Terrence L. Bracy, Chairman of the Board of the Morris K. Udall Foundation, has announced that Brinda Sarathy, of Oakland, California, has been selected as 2005 Udall Dissertation Fellow. The Udall Dissertation Fellowship is awarded to two outstanding doctoral candidates nationwide who have achieved distinction in their scholarly research and who are entering the final year of writing the dissertation. The dissertation topic must be significant and relevant to national environmental public policy and/or environmental conflict resolution. The award covers both academic and living expenses up to $24,000 for the year. Fellows are selected by an independent review committee of environmental scholars and professionals. 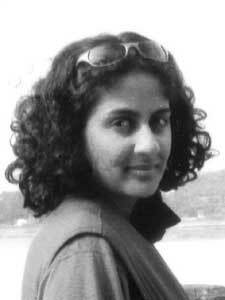 Currently a Ph.D. candidate in Environmental Policy and Management at the University of California, Berkeley, Brinda’s interest in natural resource management and forest conservation was fostered as a high school student in Kokaikanal, South India, as a tourism-fueled building boom caused water shortages and deforestation. After graduating from McGill University, Brinda returned to India to intern with the Aga Khan Rural Support Program in rural Gujarat. Currently, she is a member of the Board of Directors of the Jefferson Center, a non-profit organization that promotes communication among natural resource workers in the Pacific West. In her dissertation, “Hidden in the Understory: Immigrant Labor and Healthy Forests in Southern Oregon,” Brinda explores the issues facing Latino workers in the management of public forests in southern Oregon. Using the social movement concept of “framing,” scholarship on community forestry, and literature about migrant workers in agriculture, she analyzes how and why immigrant forest workers continue to be ignored in debates on “healthy forests.” Her questions address the historical processes involved in the Latinization of forest work; institutional responses to immigrant labor in forest management; environmental discourses on healthy forests; and the concerns of forest workers and their families. The Morris K. Udall Scholarship and Excellence in National Environmental Policy Foundation was authorized by Congress in 1992 to honor Congressman Udall’s legacy of public service. The Foundation is supported by a trust fund in the U.S. Treasury and contributions from the private sector. There have been 18 Udall Fellows since the first awards in 1997.